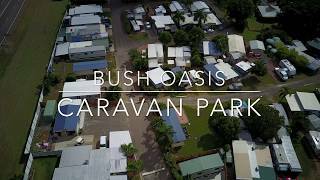 Bush Oasis Caravan Park - Your sanctuary to restore your inner balance. Catering to the mature audience and international tourists. Situated within close proximity to Townsville beachfront and restaurants (10 to 15 minute drive). Enjoy the sanctuary of their "Adults Only Pool" complete with waterfalls. They have large sites, clean facilities and regular social nights (May to September) in their camp kitchen which has barbecue facilities, television, large fridge and cutlery. Situated just off the Bruce Highway with turning lanes they are easily accessible for the largest vehicle. Within walking distance to Billabong Sanctuary and the Tourist Information Centre situated directly across the road. Fairfield Waters shopping center is only a seven minute drive to collect your essentials. It's only a short drive to Alligator Creek National Park where you may swim in one of the waterholes, walk the numerous tracks or become the photographer with many landscape and animal life shots at your fingertips. Arrive as a guest and depart as friends as Martin and Fiona welcome you to enjoy their park, making many new acquaintances during your stay. Non Powered grassy site near camp kitchen and pool area with short distance to amenity block. Cabin with separate bedroom and double bed with linen supplied. There is a full kitchen, bathroom, and air conditioning. Note all cabins are non smoking and are not serviced. No pets allowed inside cabin. Powered grass site near pool and camp kitchen suitable for small motor homes, camper vans, camper trailers and tents. Fully self contained two bedroom cabin (linen supplied) with full kitchen, lounge and bathroom. Accommodates two adults in one room double bed and four children in the second room which has two bunks. Please note cabin is not serviced and non smoking. Pets allowed in fenced yard only - conditions apply. Powered slab sites are mostly drive thru and have available water and power connection including sullage. Some are shaded by large mahogany trees whilst others are in full sun. Open plan cabin with cooktop cutlery tv, full fridge and outside ensuite . Linen supplied. Please note cabins are non smoking and not serviced. Air-conditioned cabin with double bed. Facilities include cook-top, full fridge, television and undercover area. Linen is supplied. Please note cabin is non smoking and not serviced. No toilet or shower though it is situated next to the amenity block. Note cabin is non smoking. No pets allowed inside. Unpowered site for campervan or tent fortwo adults including entry for two to Billabong Sanctuary. Powered site for two adults and Billabong entry for two adult backpackers only.